Hello , can I know what you used to create this map ? I mean another editor than the one the game has ? Cuz I want to create a pretty simple map to play with my friend on gameranger but after he joins the lobby the map becomes grey out , I gave him the map and we both checked that we putted in my documents/stronghold/maps. We can play this map and others that we downloaded from this site but not the ones we create. I tried to find out whats the problem I even open one of the maps we downloaded from this site in stronghold's editor and the only thing I did was to save it with another name and gave it to my friend. Still didnt work . The exact same map I downloaded from this site that works , it doesnt work when I edit it. Help plz ? 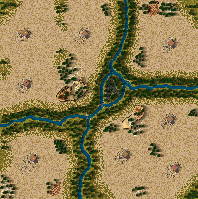 How can I create maps on my own that can be played. Did you've check which version of your Stronghold Crusader you use? Seems like the MAP builder use v1 of he's Stronghold Crusader version. And i'm didn't much know are it's compatible too for v1.2 or even both coz i'm only build MAPs for v1.2 version. Thanks. BTW you can take a look to my creations. Feels free and appreciated always be opened.